Um Houston….we might have a problem. The grid walk at the 24 Hours of Daytona last year resembled the Grand Prix of Utah, not a whole lot of people, a couple of thousand, maybe. This year, the walk was wall to wall people. People on the track, people on the grid, people on the grass…..thousands and thousands of people. Many, many thousands. 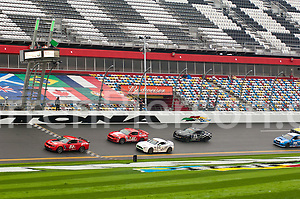 At a Grand-AM race. No kidding. The race itself was quite good as well, we might have to start to make a habit of this. Maybe. 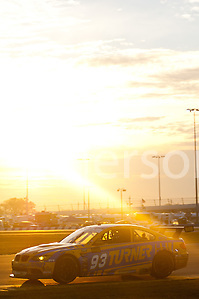 The support series for Grand-AM, the Continental Tire Sports Car Challenge, ran the BMW Performance 200 on Friday. Much like their qualifying session, the race was filled with what seemed like endless yellow flag running. 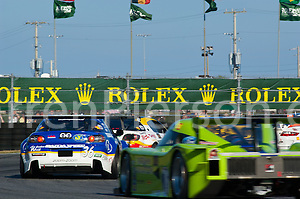 I ran around the grid for a bit before hopping into the Stevenson Motorsports box to shoot the start of the race. Kudos to them for letting me into their space. It was lightly raining during the grid walk and just before the start of the Conti race, the officials let the cars go out and run two test laps to decide whether to start on wets or drys. I found this to be a bit strange, but I imagine they were trying to keep the crash count at a minimum. In my experience, you guess on tires and if you are right you look like a genius and if you are wrong…well, you know what happens then. Saturday is dedicated to the Grand-AM race and there are no other support series or non Grand-AM activities happening, not even a morning warmup. The 24 starts fairly late in the day at 3:30 PM EST, so the morning of the race is fairly leisurely as compared to most of the events we shoot. We headed down to the grid walk about an hour before the start and were greeted by the mass of people I described at the start of this post. It was crowded to say the least. We strolled about for a bit shooting drivers at their cars and soaking in the atmosphere. I had staked out a space in the ARJ box so that I could shoot the start, but as the time ran down, more and more VIP type people kept crowding around me and I realized that someone was certain to jump in my way and &*&!*(%*^#! my start picture. I ran out of the ARJ tent and went up a few to the Oryx Racing box and was able to quickly obtain permission to get in their way and shoot the start. A big thanks to them, I wish them and their Audi R8 a great maiden season in Grand-AM. All was well, I got in, got the start of both classes and got out. Mission accomplished for 10 minutes or so. We dinked about the International Horseshoe for a bit and then headed along the track up to T5. The plan was to shoot until sunset and then head back to the RV for food. I intended to actually shoot the sun setting, but messed up my timing. Happily, I was able to wrangle admittance to the top of a motorhome and shot the late day glow as a background against the oval T1 banking. Not what I originally intended, but it worked out. I got up at 5AM to go work the pits and to shoot the sunrise. There was no coffee in the media center….. If you have ever shot at Daytona, you know that the teams set up walled tent enclosures around their boxes. This makes it extremely difficult to see up the pit lane and to know who is going to pit. You have to run up and down pit lane sticking your head in and out of the team enclosures. Not much fun to be honest. When I arrived in the pits at 5darkAM, there had been enough attrition during the night that many boxes were empty and I could camp out and look for the telltale wormsign of lolly pops in motion. Hmm, a Herbert reference. I had some fun watching a DP brake/rotor change. It took less than a minute. As the morning went on, the sky started to lighten and I checked the media center again, still no coffee. Drag. Last year, the sunrise was occluded by a giant fog bank; today, I faced only a huge wall of clouds. Neither was optimal, but the clouds were better than the yellow flag inducing fog. I kept on shooting past the sunrise hoping for that nice warm morning glow, but the sporadic cloud cover was causing me grief. I went back to the RV about 8AM and resurfaced just before the finish. This entry was posted on Sunday, January 29th, 2012 at 4:15 PM. It is filed under Daytona International Speedway, Grand AM, photo, Places We Went, Racing, Rolex24 and tagged with Daytona International Speedway, GrandAm, Rolex24. You can follow any responses to this entry through the RSS 2.0 feed.